We’re going to focus on a topic that is popular with a lot of people, which is the quickest ways to lose sales. There is a plethora of business tips and information out there about how to make sales, but what behaviors do we practice that result in losing sales? There are many ways to lose a sale, whether you lose the customer at the very start of a pitch, somewhere in the middle, or near the end. 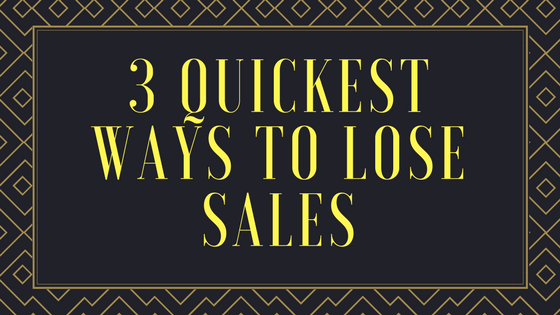 The 3 quickest ways to lose a sale, though, are below. If you aren’t mentally ready to communicate with the customer. If you haven’t taken the time to understand the customers wants, needs, problems, or issues. If you have been communicating with them on a service level, without really preparing to provide them with the perfect solution to their issue, then you’re going to lose the sale. Whether you slept in and turned up late to work, or you were late to return their call. There are a variety of ways that you can be under prepared to handle a sale. If your mind isn’t in the right place, focused on the customer, then you’re going to see a sale walk right out of your door. This is a first impression, which is everything in business. If you bumble the first impression, you’ve lost that sale before your pitch has begun. You know what it means to assume, right? There are many assumptions you may come to during a sale, from assuming that they have the money for it, that you’re dealing with the decision maker, or that they are going to be your client, they’re going to make this purchase, and so on. If you go down this path you’re putting up walls, potentially causing them to pull away. As you near the close of the sale you’ll realize your error, by which point you’ve gone too far and you’ve wasted time by not determining the facts at hand. Every sale is about the customer. You don’t need to overwhelm your customer with an about us, a back story about where you came from and what you do. The internet is a wonderful thing, if they want to know all of that, they’ll look you up. The customer wants someone who is focused on solving their problem(s). They have an issue, and they have come to you, a professional, to provide them with solutions. So, when you approach a sale, your focus should be on solving their problem. The customer isn’t interested in how long you’ve been in business, they’re interested in someone solving their problems. So, in summary, the three quickest ways to lose sales are: being unprepared, assuming, and making it all about you. Make sure that you (and your team) are prepared for every sale, that you communicate openly with your customers, and that you make it all about solving their problems with your products.